Get ready for the ultimate racing showdown with Sonic and his SEGA friends! Sonic and SEGA All-Stars Racing is a fast and furious battle to the finish line…. Suitable for the Nintendo DS. In a frantic battle to the chequered flag, Sonic and Sega All-Stars Racing sees Sonic and friends speed around tracks set in mediaeval castle ramparts, lush rainforests and bustling cities, all taken from the visually rich and varied universes of Sonic and Sega. Fan favourites such as Dr. Eggman, Tails, AiAi, Amigo and many more will join Sonic in their custom built vehicles, revving their engines and jostling to stay ahead of the pack. Each character will race around the track in cars, planes, motorbikes, and in AiAi’s case – a banana mobile! Secret short cuts, swift handling and avoiding strategically placed obstacles are certainly the best way to get to the top of the podium. For ages 7 years and over; EAN/MPN/UPC/ISBN: 5055277002191. This toy costs approximately £19.99 (for the latest and best prices make sure you check our retailer list for the Sonic And Sega All Stars Racing DS above). 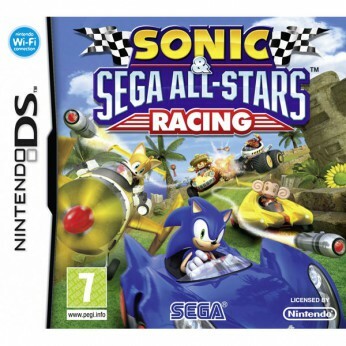 In our review of Sonic And Sega All Stars Racing DS we classed it as being suitable for ages 4 years, 5 years, 6 years, 7 years, 8 years, 9 years, over 10 years, Teenagers but recommend you check the manufacturer specific advice before purchasing.